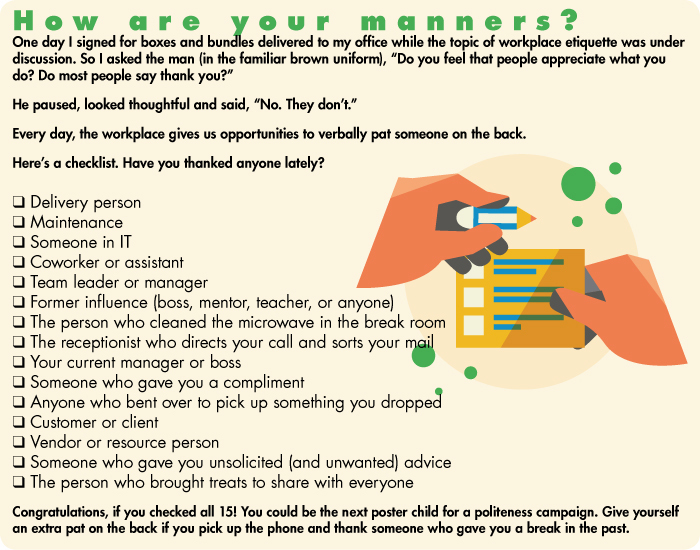 We all know that being likeable can get you a job, and help you keep it, and good manners has a lot to do with that. With smartphones ringing, pinging or playing a catchy tune to get our attention, every message has a way of feeling urgent. We don’t want to miss a single call, text or tweet. As masters of all things digital, we constantly connect to the virtual world, but we work in the real world. We’re not pointing fingers (that would be rude). But more and more career advisers warn that while digital interaction has become the norm, soft skills—our personal qualities and social graces—have waned. And so has our likability. If so, we need to strengthen our ability to bond and build human connections. Perhaps now more than ever, we need to be well mannered. “‘I laid my phone on the table before the meeting started, she said. I explained to the board that my mother was in the hospital and I might have to take a call. I apologized in advance. I picked up my phone when it vibrated and left the room, quietly. At the next meeting, almost everyone took a call and stepped out while the meeting was in session. There’s no denying that a modern Pandora was let out of the box when the phone on the table prompted her exit. And it’s no surprise that others then modeled her behavior. What worked for one person, worked for everyone. Respect is the operative word. Despite 21st-century technology, when we pass through the gates of paid employment, we enter a professional environment that is, at its core, interactive and social. “Be present while you’re there and make an extra effort to connect live,” Farley said in a segment for the CBS This Morning show. True to his own calling, Farley authored a section on new manners for new times in The Experts’ Guide to Doing Things Faster and edited an anthology, Modern Manners: The Thinking Person’s Guide to Social Graces. On the topic of new age protocol, he’s a corporate speaker and frequent guest expert on network TV. It comes down to this: Add common courtesies to a foundation of technical expertise, and voila! We become more vital, competitive, promotable and likable. Fortunately, graciousness is a skill we can learn and relearn. In other words, we can practice being polite. So let’s do. Ratchet up the magic words: Is there anything we can do to make the office a more congenial place? Yes. And we’re so glad you asked. We’ve outgrown reminders from teachers and parents, but the Old School rules they taught us still carry a certain magic. Even now, in a high-tech, diverse, multi-generational and global workplace, two little words—please and thank you—are golden. It’s true that core courtesies we learned in childhood can put a shine on our image, spiff up our professional relationships and increase our likability. The essentials are elementary and practice makes perfect. Don’t miss a chance to practice being polite. You’re welcome—When a customer, coworker (or anyone) thanks us and we reply, no problem, is that a problem? Well, yes, in professional settings, it is. No problem is appropriate if someone spills your paper clips or upsets the apple cart in some way, says Farley. But when we’re thanked, you’re welcome is the thing to say. Excuse me—An office cubicle is a workspace and though there’s no door to be closed, there are boundaries, according to career advisor Jodi R.R. Smith, author of From Clueless to Class Act. Before “barging in,” knock lightly. Say excuse me. Ask if there is time to go over X, Y and Z. If you expect more than a two-minute conversation, email in advance. Suggest a time frame. I apologize—The words I apologize are a powerful tool for diffusing damage caused by a mistake or a blunder. Put ego aside. Make the apology meaningful. Find out what went wrong and figure out how to fix it next time. If we’re part of the problem, we’re part of the solution, too. Be aware, if you or anyone chronically drops the ball and sorry trips off the tongue too easily, it can be very hollow, Farley says. Thank You (with a 49 cent stamp)—As outdated as it may seem, a thank you sent through the mail after a job interview carries more weight than email and can help increase your likability. With a steady stream of emails cluttering an inbox, a sincere letter or note arriving by mail is a rarity. If not deliverable within two days, slip it into a priority envelope. Be brief and be sincere. Indeed, after any significant circumstance, put pen and ink to paper for a special effect. Is there anything more we can do—Beyond the basics, yes, there’s much more we can do to boost our careers and make the office a more congenial place. We can dress professionally, keep confidences, give credit to others for a job well done, avoid offensive language and tread lightly over hot and politically sensitive topics.